Juki Pearl Line MO-654DE Review - Is This Product Any Good? When it comes to professional finish and satisfactory performance, the Juki Pearl Line MO-655 is the perfect choice. It comes with the set of features that would suit a user of any expertise level. The machine will guarantee a frustration-free experience long even after the warranty lasts. To make our point sound convincing enough for you to choose this machine as your overlocker, we’ve come up with this review. Let’s see why this should be your choice! 7 JUKI PEARL LINE MO-654DE: Where to buy it from? 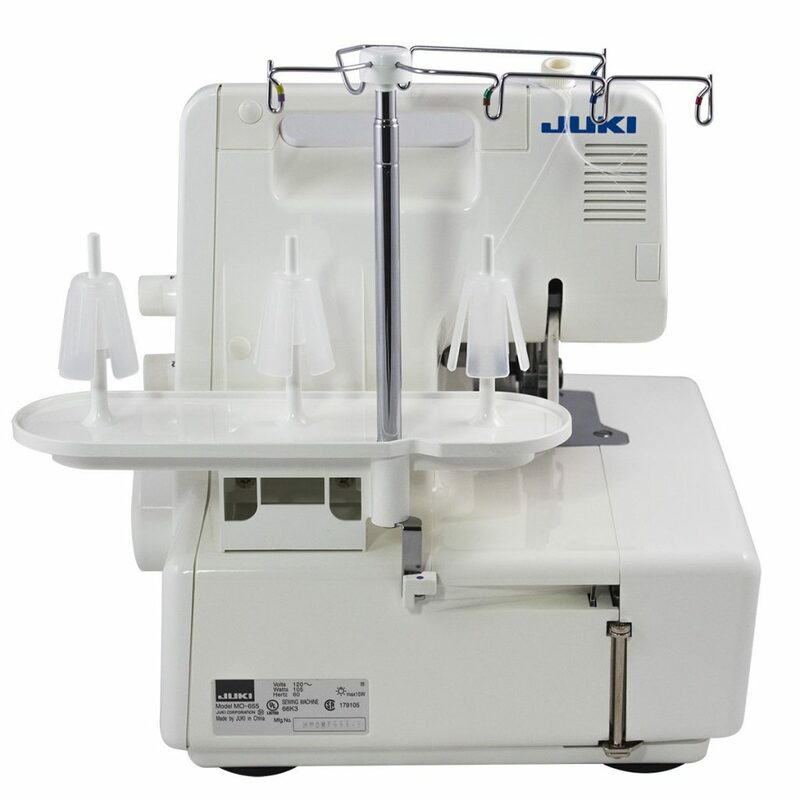 Juki Corporation Ltd. is a Japanese brand that manufactures industrial and domestic sewing machines. The headquarters of the brand lies in Tokyo, which is the lead manufacturing plant as well. The brand is known and recognized all over the world. Recently, has been ranked as the no. 1 sewing machine manufacturing brand. It has been proving out to be very promising in terms of service and quality. The machine comes with a very brief manual that guides you through all the issues and queries. Maintenance of the machine is a very easy task. You have to be very keen about the rules provided regarding some parts of the device. The Loopers and Feed dogs are to be cleaned after every use if you want a smooth running experience with the course of time. Clean the head of the machine with either a damp or a dry cloth. Both of which depend on the need, very frequent cleaning is, however, not required. Lubrication of the device to avoid unpredicted jams and noises is advised to be done monthly. Lastly, the machine will require a little inspection visit, and we’d advise you to schedule it every year with a repair professional. Threading guide is convenient and colored. This way they offer a consistency in the stitching pattern when threads are being locked into tensions. The upper knife is moveable, which commits to a safe and easy threading process. The knife also aids in cutting through any sort of fabric, be it dense or light. 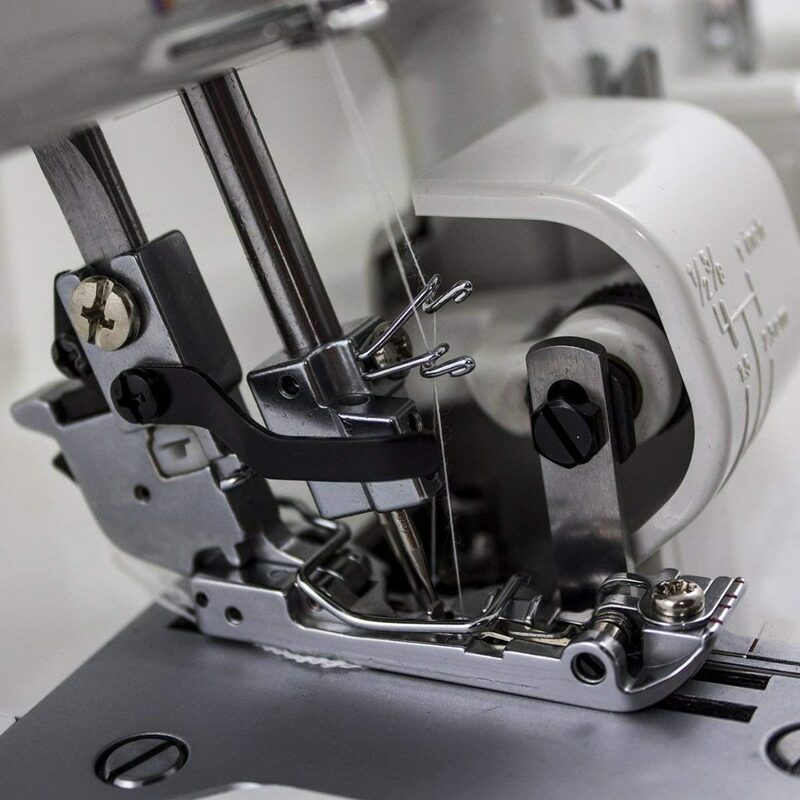 The machine offers fingertip control over rolled stitch creation. Besides, this can be achieved without changing the foot or plate. It provides a very professional look to the edges which is helpful. This, in turn, produces high quality projects and garments, etc. 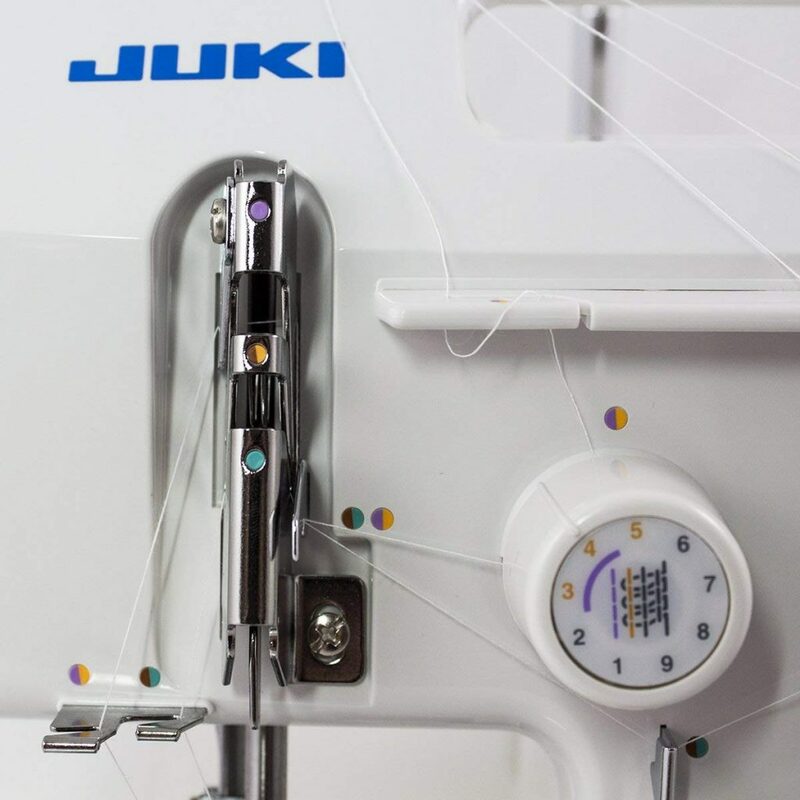 The Juki Pearl line M0-654DE also comes with an easiness at the looper threading which is very helpful if you’re a beginner. The machine comes with a very bright LED lighting that aids in the working process irrespective of the surrounding light provision. It is very helpful with the thin and stretchable materials. Likewise, this stops their unnecessary movement and saves it from getting de-shaped. The material will not remain tight. Moreover, the machine comes with adjustment dials that can control the length as well as tension, etc. The tape guide is present on the pressor foot which aids in sewing seams in a stretchable fabric. The tape works to keep the fabric in place during the whole process. The machine also, comes with industrial tension and cutting systems. The Juki pearl line MO-654DE comes with a 2-year warranty on the light assembly, motors, switches, wiring, speed control, and circuit boards. This is very beneficial because most of the issues arise in these parts of many machines if not handled correctly. On all the other parts, the warranty will last for a good 5-year span. Consequently, the best part about buying this machine is the vast fabric support that it offers. 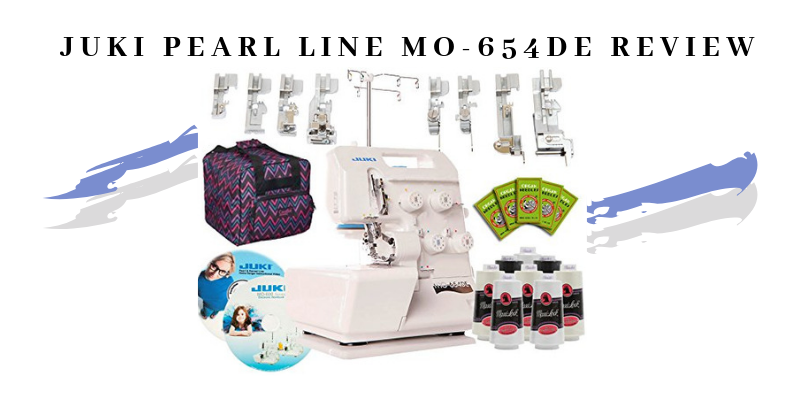 You can also, use a variety of different fabrics and create whatever you will with the help of Juki Pear line MO-654DE serger. It supports difficult fabrics like upholstery or leather/suede. It supports blends/rayon or polyester as well. Fabrics like canvas/twill or types like plastic/rubber are also welcomed with the steady working capacity this machine offers. It also works smoothly with multiple layers of fabric, which is a catch when to difficult tasks like quilting. The hard knitting process doesn’t seem that hard when you’re using the Juki Mo-654DE. In fact, with its great features and attention-to-detail, you can manage very thin fabrics like silk, taffeta, velvet or satin. Natural fabrics like wool/ cotton or linen also work well with it. The Juki Mo-654DE comes with the versatility that users want to create whatever they will in very less time. Similarly, it helps to gather the fabrics, whichever sort that user wills to use along the seam. It also helps to create decorative bunches in necklines, sleeves or skirts. Therefore, it is safe to say that the machine is very user-friendly. Similarly, it has been made to suit any expertise level; the beginners can benefit from so many features that this device offers. The Juki Mo-654DE also takes care of your safety. It has a safety switch that immediately disables the machine motor when the swing cover is opened. This will prevent the machine from running and causing any unpredictable damage. The sewing speed that this machine offers is really nice and also adjustable according to your need. The multiple stitch options are very helpful as they don’t restrict you to a specific sort of stitching every time a creative though pops up in your mind. Normally the main drawback that comes with sergers is their unmanageable size. The Juki Mo-654DE not only provides you with pleasing features, but it also comes in a very satisfactory size. Even though the machine is powerful and can support any sort of hard work with any fabric, the compact size is the catch of this model. You can store and carry the machine very easily. It was really hard for us to finally think of something that this machine offers unsatisfactory. However, some users complain about their threading experience with this machine. This is not a big issue. However, it can be a glitch or a human error that the machine doesn’t stay threaded after set-up. JUKI PEARL LINE MO-654DE: Where to buy it from? When you’re in the process of making an investment, it is a difficult task to trust a retailer. If the above-mentioned review has proven out to be satisfactory for you, you might be dreading the purchase. However, it is always satisfactory to make a purchase from a registered and reputable place. This can be your lifetime investment, and likewise, you don’t want it to go wasted. For that, we thought of assisting you and providing you help in this regard. Moreover, here’s where you can buy a completely trustworthy product. 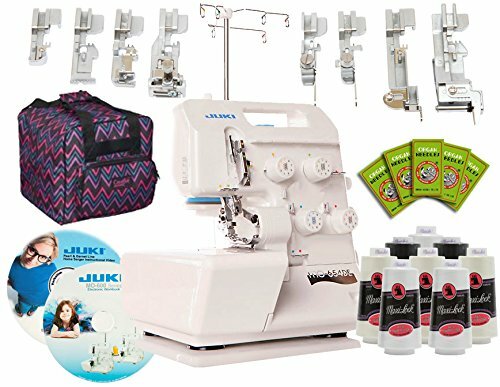 Not just the product, you can get a whole bonus package that includes 8 thread cones, serger tote, 8 piece foot kit, 50 needles, electronic workbook, and instructional DVD as well. Now that the whole review is in front of you, we leave the choice of purchase on you. 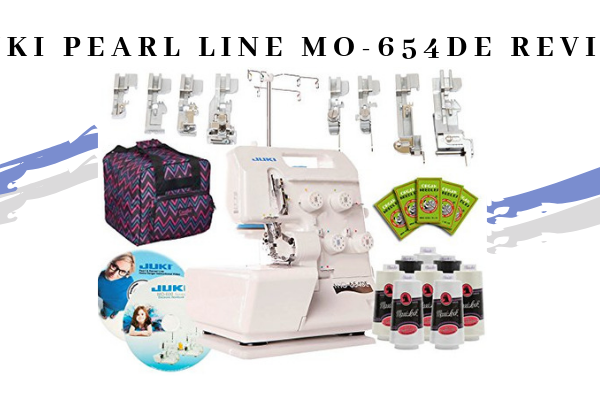 We’ve tried to provide you with the most genuine set of information that we hold regarding the Juki Pearl Line MO-654DE. You must have also seen a little complication that customers have complained about, but that can also be subsided with good handling techniques. According to our expert advice, the product comes with great features, nice warranty life and also, user-friendly working procedure. These are features that you normally require in a good overlock sewing machine. Whether you’re a beginner or a professional, you’d require a compact and sweet serger for your working space. This machine can be the most accurate choice for such an investment.